Our new season is upon us and I would like to recap the previous season and give you a preview of the next one. We have continued to make improvements at our Crosby Sanctuary in Clay County. These include a new bridge over a wide culvert on the main trail, a new kiosk at the North entrance in the Orange Park Country Club and some benches to rest on along the main path. Unfortunately, we had a large unanticipated expense at Crosby when we discovered that there was a Pine Beetle infestation and several dozen trees had to be cut down to prevent the infestation from spreading to nearby areas. We had a great turnout at our second annual Christmas Bird Count for Kids at Camp Chowenwaw with 46 youth participating. Our Youth Outreach Director, Christina Dembiec, has started the Northeast Florida Young Birders Club for high school age students. We moved the end of the year breakfast to a new location at the Arlington Lion's Club Park. This event was well attended and we will reserve this location again for next year. We have some great programs scheduled for our upcoming season. Members should be receiving their print copy of our annual calendar in the mail any day now. If you're not a member, we hope you'll join. Also, our calendar can be downloaded and printed here. This year we are asking for advance notice for those who want to share photos at the potluck dinner meeting in December so that we can allow more members to participate. Please contact Deb Kainauskas for scheduling your photos, 904-254-0148. We have kept many of our favorite field trip sites and added a few new areas to explore. Please join us for fun and adventure. You can contact me for information about the camping weekend events, 904-612-7036. Contact us for volunteer opportunities such as Eagle Watch, Crosby Sanctuary work days, Christmas Bird Count for Kids, Shorebird stewarding or the Great Backyard Bird Count events. I look forward to seeing you enjoy our calendar of events. Thank you to all of our great volunteers. Please know that you are greatly appreciated. EagleWatch Training, September 17, 10:30a.m.-12:00p.m. On Saturday, Saturday, September 17, the Audubon Center for Birds of Prey will conduct an EagleWatch training session at Deerwood Country Club at 10:30 am. 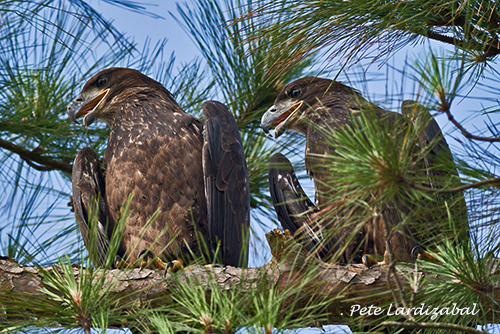 Find out where eagles live and nest in NE Florida. Volunteers can earn volunteer hours for school. Be a part of the expansion of Audubon EagleWatch on a statewide basis. Come to Deerwood Country Club on September 17 and make a difference! Call Ann Harwood-Nuss, Audubon EagleWatch County Coordinator, at 904-635-9311 for more information about the program. Mr. Moyer will share highlights of his doctoral research on how birds combat ectoparasites. He will discuss how a bird’s behavior, its bill morphology, and even its habitat can affect how well it can defend itself against parasites that infest its feathers. We'll hear the story of how a medical device that currently treats people around the world arose from his basic research on bird-parasite interactions. He will also give an update on the first year of the Bolles School Bluebird Project, providing details on the many successful Eastern Bluebird nests, sharing a few surprises and challenges, and discussing future directions for the project at the school and in Jacksonville. Brett Moyer teaches Biology and Environmental Science at the Bolles School. The NEFLYBC got off to a good start earlier this year. This joint project between Duval Audubon and the Jacksonville Zoo and Gardens is for young people ages fourteen to eighteen.. All levels of birding skills are welcome from beginning birders to advanced. It's a great way to sharpen your birding skills, learn from experts, make new friends and most of all, have fun doing it! For more information about joining, email NEFLYBC@duvalaudubon.org.